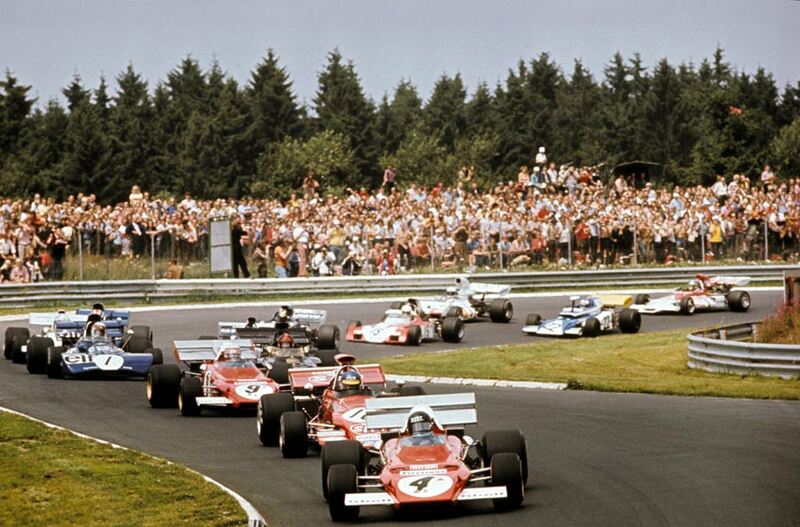 Jacky Ickx dominated on his way to victory at the German Grand Prix, leading from start to finish and breaking the lap record six times, as he eased home more than a minute ahead of Ferrari team-mate Clay Regazzoni, who was returning after missing two races because of a broken wrist. It was a bad weekend for the championship leaders - Emerson Fittipaldi and Jackie Stewart - who both failed to finish. Oil from Fittipaldi's gearbox caught fire on the 11th lap at the back of the pits, while Stewart clipped Regazzoni while trying to take second place on the final lap, skidding into safety barriers. Stewart was livid, accusing Regazzoni of blocking him. "I was ahead of him going into the bend, but instead of giving way he just drove on and into me," Stewart fumed. "The incident cost me a certain third place and could be vital. It could cost me the world title." Even before then Stewart was angry, claiming Regazzoni had been zig-zagging down the straights to baulk any overtaking attempt. "I didn't think it was particularly sportsmanlike and it's not the kind of behaviour I have ever experienced with any other driver. It was tactics I don't believe in and I hope he never tries it again." Ickx was the quickest into the first corner and was never again challenged. Ronnie Peterson held second for five laps before Fittipaldi passed, and his race effectively ended when he spun on lap nine. A lap later Fittipaldi, some 37 seconds adrift, drove past the pits trailing blue smoke, and he stopped and jumped clear as the nearest fire crew were called into action. After the final lap incident Stewart was classified 11th and his demise handed a Ferrari 1-2 to Ickx and Regazzoni with Ronnie Peterson's March finishing third ahead of Howden Ganley in the BRM. Brian Redman was fifth in his privateer McLaren while sixth was Graham Hill in what was only the former champion's second points-scoring finish of the season. The lack of points for either Fittipaldi or Stewart meant with four rounds remaining Fittipaldi (43) led Stewart (27) by 16 points with Ickx moving third on 25.